This executive home sits atop of seventy beautiful acres. Lots of wild life and mountain views as far as you can see. Very quiet and private location. Great for families with active kids. Wonderful hot tub sits on private deck. Have all the luxuries of home, with high speed Internet, and HDTV. Centrally located to many great tourist destinations. The formal dining area seats 8, or you can enjoy the charming restaurant style booth or patio dining set. Sleeps 8 - 3 King sized beds, 1 queen size bed. Bathrooms in both the loft and lower levels have shower- tub combs with double sinks. Bathroom on main level has shower stall and single sink. Definitely would love to come relax again here. Great cabin and location. Will stay there again. Amazing view and got to see snow for the first time! This house was amazing, it was big, the kitchen was fully stocked with everything you need for your everyday cooking we were even surprised there was laundry supplies!!! The view is breathtaking it was beautiful and even better we got to see snow for the first time, even the kids were excited to build their first snowman! I must admit we had a hard time leaving the cabin since we were driving a Yukon not a 4x4 which is recommended...we had to go to town in my in laws 4x4 to buy snow chains for the tires but after that everything was great we were able to enjoy the rest of the stay and visit the little towns around. The kids also got to see the deer up close as they came by the house during the early morning and around sunset. We fell in love with the place even my 4 year old wants to come back...i would recommend it for big families though sonce is such a big house each room is in a different floor and with small kids is difficult to keep an eye on them late at night. I have stayed from December 21-28th first day i arrived there was a huge snow storm. The drive up was a little scary but absolutely breath taking! My kids loved staying here they don’t want to leave! Yesterday there was another snow storm we spent the night playing in the snow. The house is very clean and cozy. The only complaint i have is the heater in the master does not work, so if you have to get up in the middle of the night to use the bathroom wear slippers, floor is freezing! The view is spectacular! We saw many many deer. We did a little hiking which was awesome! Didn’t make it far since we are from Texas and the thin air here gets to us and we tire fast! No cell service, but there is WiFi. We were all ok with this, we spent quality time together and not on our phones the entire trip! This is the perfect location! Colorado Springs is 1 1/2 away we did all of our shopping there, divide Colorado is 30 min away we went to see the wolf’s and that was incredible. Snowmobiling and ice fishing in buena vista colorado which is 1 1/2 away..... the views on the drives were Amanzing! 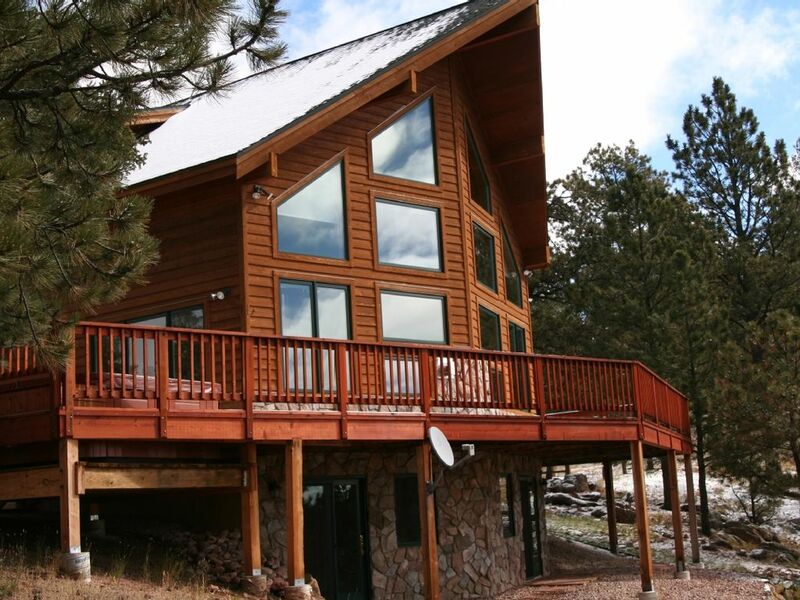 This home was perfect for our Christmas vacation! We had plenty of snow! Owners decorated the inside..... everything was just perfect! Thank you for opening your home to us, we will definetly be back!!! we were very surprised at the condition, based on the news we got here from the fire. We loved the house and the amenities very much. This was our third stay there and it was most pleasant. The new utensils in the kitchen made it great to prepare our meals. There could have been more towel and wash cloths available but we made due by washing what we had. took a drive on Independence pass one day and saw a lot of fres h snow on the peaks which made for a beautiful drive, also it was the perfect time for the fall colors. The trees were beautiful. over all a perfect trip. The home offered everything we needed and more. The sunset views were amazing from the picinic table. We also hiked around the property and got a good work out. We had no issues to report everything was prefect. 15 minutes to Cripple Creek known as one of our few Casino Gambling areas, located on top of the world with absolutely beautiful views, minutes to Victor - one of the few and largest Gold Mines in the country. Wonderful restaurants, entertainment and mine tours. 40 minutes to Canon City - visit the Royal Gorge, take a white water rafting trip. This area of Colorado is smothered by National Forest/BLM/Wilderness areas. - within 5 minutes.